Should you freeze your eggs? This is SUCH a hot topic right now. So many of my girls are seeing ads follow them all over the internet and everyone wants to know- is this really for me. I’ll talk you through why you should (or shouldn’t) freeze your eggs, why your fertility is super important even if you AREN’T currently trying to conceive, and how to best take care of YOU so that you get the best eggs possible, and I’ll answer all of your questions. Hey. Hi Instagram. Hello Facebook. How are you guys? I know, I’m a few minutes late. I had some technical challenges on Facebook so it delayed me coming on, but I’m here. How is everyone? Hello, it is Thursday again. I don’t know where the time goes. It goes fast is what it does. So hi. Thank you to everyone. So Facebook first. I want to just say 10,000 followers, not a single one of you have been purchased or bought or are a robot or are fake, and I’m very proud of that. So thank you so much for your dedication and your enthusiasm and following me and I just love you guys. You guys have been apart of my growth and message and transformation for a long time. I want to say like eight years or something like that. So, thank you, thank you, thank you. And to Instagram, you guys are always rocking it. We’re almost going to hit 6,000 probably in the next month. Awesome. Instagram’s a newer space for me to share my message. And obviously these Facebook lives are only about a year and change old and I love them. I love to get to come to you every week and just chat about health and wellness, and I love to support you however I can and encourage you and inspire you. So, I just, oh, you’re so sweet, you’re the highlight of my Thursday. Well, you guys are too. I do love this. I got to be honest. I love it. I love knowing the potential of who I can reach and who I can impact and I love sharing the knowledge and the information. I love preparing. I love discussing with my team what we’re going to talk to you guys about. I love brainstorming the ideas. I just love it all too. So thank you so much. It’s an honor. It really is, it’s an honor. And to think about the power of the Internet and how I can be chatting with people all over the world right now and that’s crazy and awesome all in the same vein. So, those of you who are new to me, welcome and thank you. Thank you for letting me into your life, thank you for letting me be a part of your health journey. Remember, health is mental, it’s emotional, it’s physical, it’s nutritional, it is all of the above. I talk about all of this in all of my books. I got three books. You want to learn about them, head over to aimeeraupp.com/books. Check them out. Body Belief is my latest baby and she is just one year old and she’s right here. And if you haven’t checked her out, you should. We also are giving away a free five hour digital course anytime you purchase a copy of Body Belief. It’s a five hour digital course. Go to aimeeraupp.com/bookgift and check out all the deets. So today is an important conversation that comes up a lot, and I think most of you see me as a woman who helps women get pregnant, which is an honor, again, to be known as that, as a fertility expert. And one thing that I say a lot is fertility is an extension of health. It is nothing more. There is no secret fertility acupuncture, there are no secret fertility herbs. The secret is in the diagnosis from a Chinese medicine perspective and treating what you see. The secret is in that it’s a whole holistic approach. It is mental, it is emotional, it is physical, it is nutritional. So many girls are just concerned with improving their egg quality, right? I want to improve the quality of my eggs. I want to improve the quality of my eggs. That is not just about taking CoQ10 and Melatonin. That is about a lifestyle overhaul. And so, I do, I have a subset of girls in my practice that are not yet partner, maybe waiting for the right partner, thinking about wanting children at some point in their life and wondering whether or not they should freeze their eggs. There’s a lot of these egg freezing clinics popping up all over the place and making it more affordable, which I think is beautiful and the intention is really good there. I’ve had a handful of girls in my practice freeze their eggs under my guidance. And so, that’s what I want to talk to you guys about today. Whether or not to freeze your eggs I think is a really personal question. I think it comes down to a couple factors. Money, the state of mindset you’re in when you’re doing it, the state of your hormones in this moment in time, and does it excite you, does it feel good to you? Because the truth is something like 90% of women who freeze their eggs never use them. It’s this outrageous statistic. Egg freezing was introduced for women who were undergoing chemotherapy, treatments for like cervical cancer or breast cancer or any other kind of major illness. And before you go and do the treatments, you’re recommended to freeze eggs because the chemotherapy drugs can really impact the quality of your fertility for the rest of your life. And so, it’s a life saving technique, a child saving technique for women in serious health situations. And then now it has become more of a luxury option for women who are concerned or know for certain they want to have children one day and they don’t want to have the risk of dealing with fertility treatments or dealing with the inability of using their own eggs and having use donor egg. So, it’s an awesome option. I think I want you all to think about it like, it’s not a guarantee, just like IVF isn’t a guarantee that you’re going to have a child, it’s not a guarantee. If you’re in the position to have children and you’re thinking about putting it off for other reasons, I’m not sure I want you to put it off. I’d rather you go for it. But if you haven’t yet met your partner and you have the resources and you feel in a good headspace about it and you want to freeze eggs just for that insurance policy knowing you might not use them, then go for it. I see a lot of girls that are frantic and anxious, anxious about their age, anxious about dating, anxious about meeting the right person, anxious about their career and taking time off from their career before they have children. And so, what I do first is I’ll really work with them on getting to the why. Why are you going to freeze your eggs? Getting them to a place where they feel good about it and not so flustered or rushed or pressured, and then also really educating them that their fertility is an extension of their health. And just because they’re 35 is no guarantee that their quality is good. I always say, and you maybe you haven’t heard me say it, but I always say it in the clinic, I am healthier now at 44 than I was at a 24 for certain. But I’d say, at 31, 32, 33. I believe that my egg quality has improved over the years because of how well I treat myself. I just got off the office hours in my yes, you can get pregnant e-course group and I have a woman who is 44 and her AMH has doubled from last year and that’s from my program. Her doctor actually said to her, AMH is supposed to get worse with age. What is it you are doing? Because your AMH has almost doubled in a year. Her AMH has doubled in a year and that’s from the diet, the supplements and the mindset coaching that we’ve been doing together. So, I want you to keep that in mind. I want you to understand that if you are going to freeze your eggs, the most important space you come from is getting your health in check first. Giving yourself a three month time frame to follow the plan I have outlined in this book. Yes, You Can Get Pregnant is not just for girls who are looking to get pregnant yesterday. This book is for any woman who is looking to optimize her health and fertility so she can get pregnant when you want to. For your programs, do we work with you directly? Yes. So if you joined the e-course, you get access to me every week in our office hours. We have a secret Facebook group and it’s incredible. I spend about 45 minutes a week in that group answering everyone’s questions. We do a guided meditation. And then there are other options. You can do coaching options with me in addition to the e-course. So you can do two coaching sessions with me or five coaching sessions with me. So you get the one on one time as well. In my other group, the Ultimate Fertility Membership, you get quarterly live trainings with me in our Facebook group. So once every four months, but you get monthly meditations and mantras that are developed by me. We have a Facebook group so you get the community support as well. Those are the two real fertility based groups that I have. Everything else is kind of a la carte and you don’t really get access to me if you were to go on my website and buy, say like, The Yes Program. But if you join the Ultimate Fertility Membership, I’ve made that so it’s carte blanche. Like it’s so cheap and easy to join, you get access to every program I’ve developed except for the e-course and you get access to me once a quarter. And then we have the Facebook group as well. So, I think that’s the best. But the e-course, the investment is so worth it because of how much you could, you know, I don’t want you to be in that e-course for two years, three years, but you could be and you’re going to get access to me every week. You’re never going to get kicked out until you’re pregnant. And even my girls that are pregnant still come back and ask questions and it’s fine. It is a loving, open community. You get my brain every week and you can ask any of the girls in the group. I am so dedicated to that group. But so anyway, as an aside, freezing your eggs, what I recommend is this. Follow this program for three solid months and then freeze your eggs. [Cuki Como 00:10:45] You can join the e-course any time if you coach with me. So right now, the e-course is not open for enrollment. The only way to get in is to purchase a package of two coaching sessions with me and you get 50% off the e-course, you can upgrade. Or if you purchase five coaching sessions with me, you get the e-course for free and you’re right in there right now. So, that’s how we do it. Now, the e-course will open again in September and we only open it once a year for just basic enrollment. Okay, Laura, best community ever. The e-course is so, so good. Best community ever. So much support and love. You guys are great. So let me get back to the topic at hand, freezing your eggs. Gosh, you know, I think you really just want to have your head on straight when you’re doing this and understand this is a big investment, not just financially, but bodily. You’re going to be injecting hormones into your body, you’re not going to feel awesome. You’re going to feel bloated, your period’s going to be out of whack for a couple months after. So you really want to go into this in the best shape possible, hormonally and emotionally. And that’s why I strongly recommend, Yes, You Can Get Pregnant. And what I want to share with you guys today is I have an incredible resources page that goes with, Yes, You Can get pregnant, that you can access right now for free and get menus and meal plans and shopping lists and the vitamins to take and everything that is outlined in this book. So you could start this program now if you’re thinking about freezing your eggs or even if you’re just looking to optimize your fertility now so you can get pregnant naturally when you want to. So that’s what I did. I chose not to freeze my eggs, even though, 39, still hadn’t met my guy, I met him right before my 40th birthday. 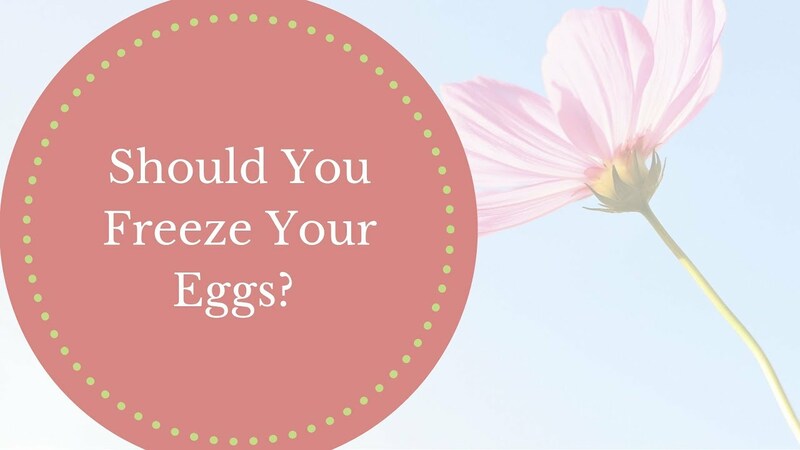 People asked me all the time, are you going to freeze your eggs? Are you going to freeze your eggs? Are you going to freeze your eggs? And people were worried for me. They were stressed. They wanted to make sure that I was going to have a baby. I rested on my laurels. No, I didn’t see the point of freezing my eggs. Rather for me was I lived and breathed everything I taught in this book from the ages of 35. 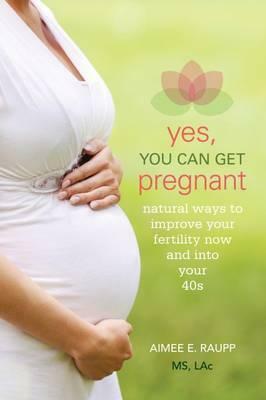 I wrote this book at 35, 35 to 39, met my husband at 39, at the age of 40, I got pregnant the second month we tried. That was my investment. Instead of spending the $10,000 on freezing my eggs, I invested in myself. Time and energy and space, I invested in myself. I still went out and had my social life and I still probably had more cocktails than I recommend in the book, but I invested in myself everyday. I worked on myself emotionally. I physically kept myself in check and I ate as clean as I freaking could. And I got pregnant like with him looking at me basically at the age of 40. And now I’m 44 and you know, hoping to have another baby. We haven’t started trying yet, but I’ll keep you guys posted. I’ll say a prayer for my husband that he decides yes, he wants another baby because I would like one. But I’m not worried about my fertility in that sense. And I know some people would think I’m absolutely crazy, but like I just said before, I have a girl in my e-course group who’s been following my program since September. Her AMH has doubled. She’s 44, her AMH went one from a 0.8 to a 1.3 in a year. She went from a 0.8 to a 1.3. For you guys that know what that means, that’s incredible and actually unheard of according to Western medicine, AMH should only decline with age. It definitely shouldn’t almost double at the age of 44. But hers has. Her FSH has gone down, her antral follicle count is incredible. She’s 44 guys. Because she’s worked on the diet, the supplements, the emotional, the physical and the nutritional pieces all together. And that’s what matters. So if you’re going to freeze your eggs, I wrote a whole blog on this, if you want to go and read the blog, it’s Aimeeraupp.com/eggfreezing. Go and read the blog, get more information. But if you want to do this, take it really seriously and do it right. Give yourself a three month prep phase. Invest in your body, invest in your health. Follow the protocol I have in here. I think this book is what, 16 or so dollars, 18.95 on the back, but I’m sure on Amazon you can get it, on Kindle, probably 10 bucks. Go to Aimeeraupp.com/ oh sorry, go to, yesicangetpregnant.com and get my free resources that go with the book and you’re going to get, like I said, meal plans, shopping lists, the vitamins to take. You’re going to get, I think there’s some meditations in there, there’s some mindset stuff. You’re going to get so many things. So head over there, yesicangetpregnant.com, it’s the website that goes along with the book, has tons of free resources on there. You’re going to have to enter your email to enter the website. And then if you want to read my blog on egg freezing, Aimeeraupp.com/eggfreezing. But the biggest message I want to give you guys today is, it’s not a bad idea to freeze your eggs. I want you to do it from a place that you feel good about it and you’re not compromising yourself financially or emotionally. But I want you to give yourself a prep window. If you give yourself three months, you are not going to have poor quality eggs, you’re going to improve the quality of your eggs by following a program like this. Three months is a 100 is what you need to really impact the equality. And that’s how I want you to look at this. So, let’s see, we’ve got any other questions? Laura, oh Mandy, I love your positivity. Egg freezing blog. Hello Sunny. Cuki, I got your questions. Let’s see. All right guys. Does anybody else have any other questions? Let me just make sure, I had some notes, I want to make sure I’m not missing anything. 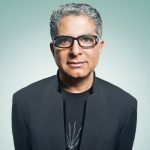 I think that’s another important point too is, again, your fertility is an extension of your health. So whether or not you’re trying to get pregnant right now, everything you do impacts your hormones and ultimately your fertility. So to keep that in mind, that it’s just not a guarantee that a woman at 25 has better quality eggs than I do at 44. There’s no guarantee about that. Zero guarantee. There’s actually zero science to support exactly what’s going on in impacting egg quality. The things we can surmise from the research is inflammation impacts egg quality. Inflammation impacts the hormones in the body, which impacts egg quality. Stress, lack of sleep impacts egg quality. So again, everything I have outlined in this book is what you need to do to improve your fertility, optimize your fertility now and into your 40s, whether or not you’re going to get pregnant tomorrow, you’re going to get pregnant in five years, you’re going to freeze your eggs. This is the game changer. It is not just about taking maca or taking Vitex or taking CoQ10 or DHEA. It is so much more than that. Food is the primary medicine. I took ubiquinol and the oddest thing happened. My follicles stopped growing. Any recommendations? Yeah, obviously I would stop the ubiquinol. Again, that’s kind of the point I was just making is it’s all about the entire picture. So it’s about the food you’re eating, how much you’re sleeping, your lifestyle, how much you’re moving, the relationships you keep, how happy you are or are not. All of those things impact. Ninu, I think you’re the perfect person to read this book and follow the entire protocol. That’s what you need to do. This is not about a supplement. One supplement is not going to change your game guys. You cannot out-supplement a crappy lifestyle or a crappy diet. Is CoQ10 really that helpful to improve egg quality? Again, one supplement is not going to be making the difference. It is about the entire picture of health in your life and in your body. I have one embryo frozen coming off three Lupron Depot injections. [Zashk 00:19:04] is pushing to do another retrieval. I got your book and feel rushed to do [inaudible 00:19:07] cycle because of age. I would Cuki Como, is that what, saying it right? Cuki Como. I would do three months following this exact protocol and then you could go in and do another retrieval. But three months, exact protocol. And that goes to you too, Ninu, same thing. Three months, then we reassess. That’s what your body needs. Your follicles need 100 days to absorb everything you’re doing differently. It will impact your fertility. Like I said, I have girls in my group that are 44. They’ve been following my program since September. AMH has almost doubled. Antral follicle count has increased, FSH has gone down. Just take that in for a second. You have so much power here. Okay guys? So much power. But you have to approach it from a holistic standpoint. This is not about a single supplement. This is not about taking injections and freezing your eggs because you’re 30. You’ve got to consider your whole health picture. I was not a very healthy 30 year old. 24, I had an eating disorder. I was smoking cigarettes. I mean, disgusting. Not regular cigarettes, but like if I went out drinking, which was probably five nights a week, I had a cigarette. I was not the picture of health. I had Eczema all over my body, I had endometriosis, my period was irregular, I had pain. I mean, I was not in good health. I am now like, yeah, it’s like rock solid. You’re sweet Ninu, thank you. So anyway, that’s what I got to say guys. So check out my free resources. Go to yesicangetpregnant.com. Check out the egg freezing blog, aimeeraupp.com/eggfreezing. Follow this protocol for three months and report back people, okay? And if you’re interested in the yes you can get pregnant e-course, the only way you can enroll right now is through coaching with me, either two pack or a five pack of coaching. The next enrollment for basic is, you know, basic enrollment, meaning you can buy it without coaching with me. So it’s the cheapest option is in September. We are doing another reboot and rewire program that starts in early May. And that program is all, it’s a 30 day mind body reset and it’s all about reducing inflammation in your body on the mental, emotional, physical levels. It is incredible for egg quality. The girls in my group that have been following that protocol, everything in their body is changing, and then also all their hormone panels are dramatically improving. So, keep that in mind. If you want to do the reboot and rewire program with us, again, it starts in May. Again, it has an incredible impact on your fertility. I’m seeing it in the numbers, I’m seeing AMH increases, FSH decreasing. We’re seeing girls, I had a girl with premature ovarian failure diagnosis. She got pregnant naturally guys. She was told a year and a half ago that she was in premature ovarian failure. She’s a doctor. She saw the best doctors and this is the diagnosis they gave her and she worked on her mindset and her nutrition and she just got pregnant naturally. She’s like 16 weeks pregnant now with a healthy child. So, it wasn’t a fluke, she didn’t miscarry. So, this is to say, there’s so much power you have. It is work. It’s not easy to go gluten free and dairy free. It’s not easy to follow an autoimmune paleo diet advice. If I suspect you have endometriosis, I get it, it’s not easy to ask for support, it’s not easy to receive support. But guess what? If you do it, it works. And I give you the tools in here and any of my programs give you the tools too. So you can check out my Ultimate Fertility Membership. Regardless if you’re trying to get pregnant, tomorrow or in a couple of years, if the resources are incredible. Or check out my book or check out my website, I have free resources for you all across the board. So, I’m going to send you guys lots of love and I’ll see you next week. Mwah, mwah, mwah. Have a great day.